Beautifully designed royal portable. 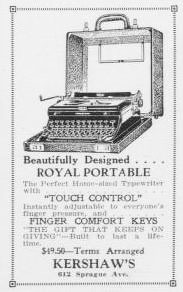 The perfect home-stand typewriter with touch control. Instantly adjustable to everyone's figure pressure, and finger comfort keys. "The gift that keeps on giving" - built to last a lifetime. $49.50 - terms arranged.